Cabin Spring is located 5 miles from the Grotto Trailhead in Zion National Park. This challenging trail climbs 2400' on switchbacks to the spring on Horse Pasture Plateau, a tableland of ponderosa and Douglas Fir set high above the Zion Canyon floor. Cabin Spring was named for a park service cabin that burned down in the 1970s. From the Grotto Trailhead, cross the Virgin River bridge to a paved path that runs flat along the river before turning sharply up the west canyon wall for nearly two miles on strenuous, exposed switchbacks. The rapid elevation gain yields excellent views across Zion Canyon with useful perspective on its extraordinary verticality. The trail briefly levels through Refrigerator Canyon, a shady reprieve that leads to Walter's Wiggles, an iconic set of 21 switchbacks carved in 1926. Walter's Wiggles spill out onto Scout Lookout, a small bluff overlooking Zion Canyon with access to Angels Landing. Follow signs to the official beginning of the West Rim Trail. 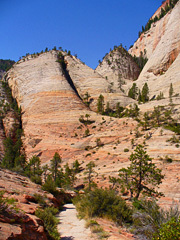 The West Rim Trail bends away from Angels Landing across open slickrock to a crest that drops into Little Siberia, a narrow canyon filled with bigtooth maple, Douglas fir and gambel oak. It nadirs across a bridge several yards above the canyon floor, then resumes steady climbing on rough-pour switchbacks to the mesa top. Be mindful of steep drop-offs and avoid narrows sections that can be deceptively slick, especially on the descent. Travel moderates on the wooded mesa to the West Rim Trail - Telephone Canyon Trail split (5 miles). A sign points to a spring approximately 100 yards away on the Telephone Canyon Trail, but you can also take the West Rim to a similar spring no more than 200 yards from the split. This trail is strenuous, especially in the summer heat. Be sure to get an early start to avoid crowds, peak temperatures and summer thunderstorms. Take all precautions with respect to sun protection and hydration. The West Rim Trail continues another 9.9 miles to its northern terminus. Its total N-S distance is 14.9 miles (some sources show it as 14.4), and is a favorite multi-day, through-park hike for many. While the Telephone Canyon Trail can also be taken to reach the same northern trailhead and is shorter, many consider the West Rim Trail route to be more scenic. Winter conditions beyond Scout Lookout can present technical obstacles - check with a ranger for trail conditions.